Three persons were on Friday reported dead in Aba, the commercial nerve of Abia State as personnel of the Nigerian Army attached to the Ngwa High School Forward Operation Base (Charlie Coy) and personnel of Mobile Police Force (PMF 55) unit in Osisioma area of the State were involved in a bloody clash. According to The Nation, a police officer’s hand was reportedly severed in the shootout, while another report has it that two mobile policemen and a soldier died in the melee. While efforts to reach both police and army hierarchy in the state until the time of this report failed to yield fruits as the State Commissioner of Police and the spokesman of the Command, Michael Ogbizi and Geoffrey Ogbonna were yet to reply to a text message our correspondent sent to their phones. 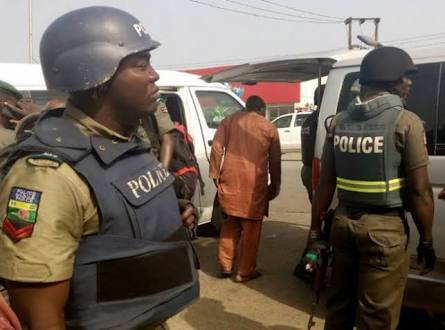 Sources who claimed to have witnessed the incident feared that incident which caused pandemonium at the major exit and entrance route into the commercial nerve of the state also wounded many passersby. According to one Chinyere Ikem, the incident forced many shop owners to quickly close for business while many petty traders along the Expressway abandoned their wares to scamper for safety as lorry load of mobile and regular policemen arrived the scene that is already charged with gunshots. Ikem said that while some passengers going to different parts of the country that were yet to board vehicles to their locations were trapped in the shootout, others coming into the country, used alternative routes to avoid being caught in the web of the crisis. “It happened like what we used to watch in American movies. It happened in a flash and before you know what is happening, trucks of army and police vans were everywhere. Police and army were shooting themselves face-to-face. From what we later learnt, two policemen and a soldier died in the gun duel. It is better seen than being told. I don’t know what is happening at this Osisioma junction. Don’t forget that some time ago, police and army clashed here and shoot at each other leaving one policeman dead. “I saw some people running with blood stain and I guess that they were hit be stray bullets. Police and army leadership in the state should call themselves to order. They are sister agencies and I don’t think that it is in their own interest to be fighting among themselves when they are supposed to be working hand in hand with each other especially as the state Governor is doing his best in tackling insecurity in the state,” Ikem stated. While normalcy has since returned to the area at the time our reporter visited the scene, shop owners were yet to open for business as people in clusters recount their experience of the incident. Okiyi who said that the state government was working with heads of security to bring the situation under control also assured that investigation was ongoing to know the cause of the incident and to fish out those behind the incident. “Governor Okezie Ikpeazu has also directed full investigation of the circumstances that led to the breach of public peace with a view to preventing future occurrence of such armed confrontation that endanger the lives of innocent citizens and security agents working in the state. “While we are currently working with law enforcement agencies to review the immediate and remote cause of the incidence, members of the public are advised to go about their normal duties as the situation around the area has been pacified. “Those responsible for this breach of public peace will certainly be unraveled and punished according the law."